The first “Brexit” is almost a century old, and it did not even involve Britain. It occurred on 14 June 1926, when Brazil notified the League of Nations it would leave the world organization. Paraguay, Guatemala, Honduras, Nicaragua, El Salvador, Chile, Venezuela, and Peru, together with Germany, Italy, Spain, and Japan, followed in the 1930s. These mass withdrawals from the League were widely interpreted as a sign that the organization was in crisis. Brexit is not a singular phenomenon. In legal terms, it constitutes a withdrawal of a member state from an intergovernmental organization, though with a profound effect on the organization being left. Since World War II, such withdrawals may have been less spectacular but they have occurred frequently. When the US left the International Labour Organization in 1977, for example, the consequences for the organization were severe. In 1984/85 when the US, the UK and Singapore withdrew from the United Nations Educational, Scientific and Cultural Organisation, the institution noted plainly that its “budget [dropped] considerably.” And when Morocco left the Organisation of African Unity in 1984, the pan-African organization no longer represented Africa as a whole. Recently, several African states backed a call for mass withdrawal from the International Criminal Court, raising pressure on the court. Elsewhere, Venezuela has announced its exit from the Organization of American States. In France, the 2017 campaign saw Jean-Luc Mélenchon promising to lead his country out of the IMF, the World Bank and NATO should he win the presidential election. In the United States, Donald Trump withdrew from the hard-won Paris Agreement within months of his presidential tenure. And in Switzerland as well as in the UK, the public ponders about the possibility of leaving the jurisdiction of the European Court of Human Rights behind. If Brexit is not a single phenomenon, what is it then? It is the most visible instance of a much larger development in which international organizations like the EU have come under intense social and political pressures. [Brexit] is the most visible instance of a much larger development in which international organizations like the EU have come under intense social and political pressures. To a considerable degree, these mounting pressures have to do with membership growth (the UN’s 193 members make forging a consensus very difficult), with global power shifts (Brazil, China, and India are asking for more rights within international organizations), and with authority gains (states have delegated more competences to international organizations to manage the consequences of globalization). Beyond these well-known sources, however, our ideas about the legitimacy of international organizations have also changed. In short, international organizations find it ever more challenging to gain and maintain legitimacy with relevant audiences. This is not necessarily because their work has deteriorated, but rather because the expectations we associate with their work have expanded significantly. Traditionally, the UN and its peers counted as legitimate if they served the interests of their member states. Today, they need to do more. Most importantly, they need to demonstrate not only how they serve their member states, but also how their activities benefit a broad range of stakeholders, including private donors, business corporations, and individuals in member states. Examples of this trend abound: the UN’s reformed development agenda stresses to leave no one behind, the WTO is now concerned with labour standards and seeks to be a democratic international organization, the African Union calls itself a “people-centered” organization, and the International Union for Conservation of Nature no longer protects nature just for nature’s sake but human well-being. 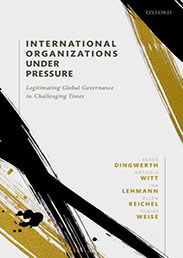 Moreover, the legitimacy of international organizations is no longer only tied to what they accomplish, but also to the processes by which their outputs come about. To be considered as legitimate, international organizations like the WTO for instance need to be transparent and accountable in their decision-making. They need to offer ways for civil society organizations to contribute to their work. The WTO is required to coordinate its activities with other organizations like the World Bank and the IMF. In the context of an expanding list of legitimacy criteria, international organizations are increasingly caught in the crossfire of critique. While some of this critique is warranted, another part simply stems from national governments’ (and other actors’) routinely claiming successes for themselves but blaming failures on the international organisation headquartered in Brussels, Strasbourg, Geneva or New York. The expanding menu of legitimation facilitates such blame shifting. Brexit not only marks a turning point for the UK and for the EU; it also matters globally. Seen in a broader context, it symbolizes the end of the post-1990 era of global governance. Yet we will be unable to govern the globe without the services international organizations offer. Getting international cooperation back on track will therefore require governments to defy the blame game. Brexit is not just David Cameron’s fault. But like after World War II, getting international cooperation back on track will also require the world to come together to rethink how global bodies could work. Let’s argue about what makes the EU, the UN, and their peers legitimate (again). Image credit: United Nations Office at Geneva by Falcon® Photography. CC BY-SA 2.0 via Flickr. Klaus Dingwerth is professor of political science at the University of St. Gallen, Switzerland and a non-resident fellow of the Global Public Policy Institute in Berlin, Germany. Antonia Witt is a post-doctoral researcher at the Peace Research Institute Frankfurt, Germany.